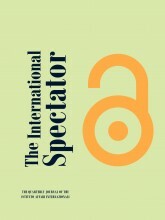 Natasja Reslow, Horizontal and Vertical Diversity: Unintended Consequences of EU External Migration Policy, The International Spectator, 54:1, IAI, March 2019. Unintended consequences arising from EU external migration policy are a result of the multi-actor nature of this policy and of policy interactions. In addition, scholars face serious methodological challenges in establishing what the EU’s ‘intent’ is in external migration policy and, therefore, in determining which consequences are intended and which are unintended. The literature on the implementation and evaluation of EU external migration policy is in its infancy, and future work should take into account all policy outcomes – both those that were intended and those that were not.